March for Europe on 2nd July. Another march has been called for 3rd September. This article first appeared in The New European on 22nd July 2016. He may have won the referendum but Arron Banks is not taking it easy. Last week the UKIP funder sent an email to Leave.EU’s supporters calling on them to help him create a new grassroots movement . His ultimate goal, he said, is to emulate the right wing populist parties currently on the march across Europe and “secure real, lasting change” for the UK. One can imagine what that change will look like. Complete divorce from the EU, severe restrictions on immigration, dismantling of the fragile rights won by women, black people and the LGBT community. Banks boasts that he is well-placed to launch this movement. He claims he can reach twenty million potential supporters every week with his message of isolation and intolerance through the networks he has built up around the referendum campaign. It was inevitable that anti-European forces would attempt to build on their victory but the extent to which the Brexiteers are coming to dominate British politics is deeply worrying. Not only is Banks on manoeuvres, Theresa May’s Three Brexiteers — Boris Johnson, Liam Fox and David Davis — are already pushing their own absurdly positive messages about the UK’s future outside the EU through the mainstream media. This is bolstered by the endless parroting by Conservative MPs and ministers that “we are all Leavers now”. In normal times one might expect the balance to be reasserted by the opposition parties. But these are not normal times. The Liberal Democrats are now such a small presence in Parliament that they struggle to get noticed. While the Labour Party is in such turmoil that it can barely take part in debates in the House of Commons let alone lead nationwide opposition to Brexit. The Scottish National Party is fighting a strong rear-guard action on behalf of citizens north of the border but their ability to speak up for the rest of the UK is obviously limited. The risk of this to our country is huge. Emerging evidence of the real damage done by Brexit will be all too easily dismissed by the Leavers using their trademark breezy arrogance. We will be told that lost jobs, lower living standards, bankrupt businesses and crumbling public services are not the fault of Brexit but rather the result of global recession, the EU itself and, of course, immigrants. And because there will be no opposition to this nonsensical spin, the UK will simply fall ever further into decline, division and misery as a failed policy is pursued without pause. It needn’t be this way. If the 48% who voted to Remain can’t rely on the established opposition parties to organise against Brexit then we will have to do it ourselves. 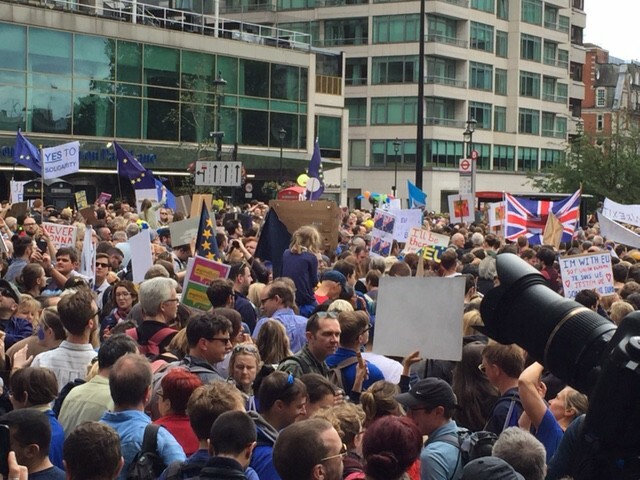 The 50,000 who marched on the streets of London on 2nd July and the four million who signed the petition for a second referendum show what can be done very quickly. But we need to go much further. The passion that has been stirred in response to the divisive campaign for Brexit and its immediate aftermath of economic crisis and race hate must fuel a movement to run not for days or months but for years. Like Gollum, the Brexiteers have got a hold of their ‘Precious’ through hard but dishonest work and they are not about to give it up easily or quickly. But it is a campaign that will need to be deep as well as long. It must be a genuine movement not a top-down public relations exercise. The Remain side relied too heavily on an endless parade of be-suited establishment figures lecturing the country on the dangers ahead. It was an approach that not only failed to persuade the majority of voters but allowed the Leavers to pretend that their cause was somehow anti-elitist and a benefit to ordinary working people. A new movement must show what rubbish such claims are by mobilising millions of citizens in every corner of the country and from every background. Some on the Remain side will be horrified by this. As soon as the vote was in they were urging others to accept the result. They took to social media expressing their unease about the March for Europe and the second referendum petition. They worry that any sign of passion or anger might alienate those who voted to leave. Their concern is, to some extent, understandable. They are right that any attempt to prevent Brexit must not be polluted by the bitterness that characterised the Leave side. They are also right that the dispute is not with the millions who voted Leave but with the campaigners and politicians who duped the British people. But they are mistaken if they think this battle can be won with warm words alone. The UK is making a colossal mistake that threatens our economy, our constitution and our social cohesion. The people who persuaded us to make that mistake are now more powerful than ever. What was once their fringe idea is now mainstream. There are others mobilising to bring equally dangerous fringe ideas into the same dominant position. These well-meaning Remainers are making the same mistake that got us into this situation in the first place. Like Cameron they seek to compromise with the populists and hope they will go away. But as history and current European politics shows, such compromise only gives the populists an undeserved credibility that makes them stronger and even more extreme. Unless we rebuild a forthright grassroots opposition to Brexit and the political forces hoping to benefit from it, we risk a ‘Polish Scenario’ where the political spectrum is dominated by two parties: one right wing and one very right wing. Those arguing for international collaboration, openness and tolerance will be marginalised. So there will be more marches. Probably quite a lot more marches. There also needs to be petitions, lobbying of MPs, social media campaigns, fundraising and stunts. But this must also be a movement that has fun with music, comedy, film, dance and whatever activity can bring people together in the name of Europe. And we should welcome those who voted Leave with open arms into that fun. We need spaces where we can listen to their concerns and they can listen to ours. We need to show them that their disgust at the way politics excludes ordinary people and the economy works against them disgusts us as well. We must persuade them that the solution is not to cut ourselves off from the world but to fight for a deeper democracy and a fairer economy. With such a generous-hearted, open-minded approach, we can not only achieve our ultimate goal of keeping Britain in Europe, we can also show the country and the wider world that something far bigger, more joyous and more honest can be built by love and hope than by hate and fear. March for Europe has called protest marches in London and across the UK for 3rd September. Find out more here. Adam Lent’s new book ‘Small is Powerful: Why the era of big business, big government and big culture is over’ can be ordered here. You can follow him on Twitter here. Author of ‘Small is Powerful: why the era of big business, big government and big culture is over’: http://tinyurl.com/jlcp6gg Organiser with March for Europe.